Wife and I decided to head to Pensacola for the weekend. So we did. Scheduled a day off Friday, loaded the car, found Beethoven's Ninth on XM, and headed south. But, no trip is without its little odd occurrences. For example, we stopped for a quick bite at the McDonald's in Greenville, Alabama. As we were leaving, some little snot-nosed kid looked up at me and yelled "Daddy!" Wife wanted an explanation. So, what to say? Should I mention that, well, I don't stray? Should I mention that, even were I to, that whole vasectomy thing many years back ruled out some stray kid in Alabama? 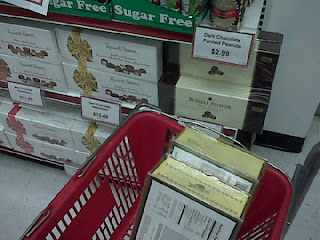 We got out of the Russell Stover outlet for less than $70. Credit sheer will-power. Tip to husbands: Wives can't ask a bunch of silly questions if they're eating chocolate-covered caramels. 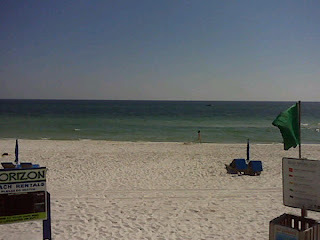 Eventually, we made it to the beach! Over an hour before it would be ready. They were turning business away, what with being booked solid because of something called "spring break" -- ever heard of it? That's one of the problems with vacationing driving distance, but in a different time zone. Pensacola is on Central Time. We went out for supper at a place called Peg Leg Pete's. I almost ordered the Chicken Alfredo. Then I remembered: Peg Leg Pete's doesn't sound Italian. So, the shrimp was good. Anyway, we're here for the weekend. Folks are taking care of Wife's animals for the next couple of days. And, the crazy people with all the shotguns who live across the street are keeping an eye on everything else. Let me take a moment and suggest that, if you don't have crazy people with shotguns living across the street from you, then you need to move ... or get better neighbors. I highly recommend crazy neighbors with shotguns across the street. It give you a feeling of security. Of course, in fairness, it's been several days since they've gone outside and started firing shotguns. Maybe this weekend. After all, it is spring break. Jo has a reminder for your Congressman. Not mine, because he's not a dumbass. But for your dumbass Congressman, call him and read him her post. One last thing... I urge Congress to quickly pass Obamacare before the House of Representatives remembers they're supposed to represent us! If they remember that, it'll never pass. Oh, and follow me on teh Twitter: http://twitter.com/basilsblog. I'll be glad you did!